First thing to know about me: I’m very interested in food and I enjoy cooking. I like to put thought into what to make, to experiment with new recipes and of course to eat. Traveling for me also means trying food I haven’t tasted before. I always go out my way to make sure we have tried some typical local dishes. But this is a chapter on cooking, not eating. How is cooking on a boat different than cooking in a house? Well, first of all there is a lot less space. 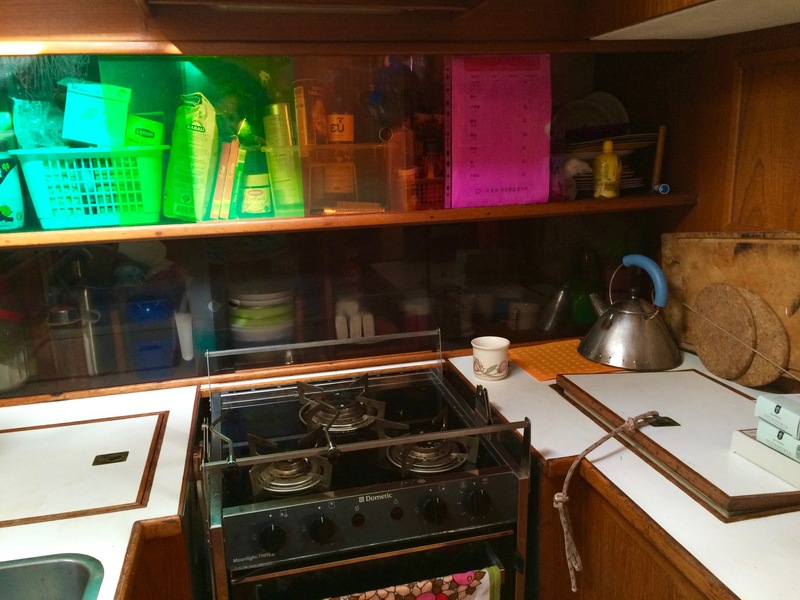 I am lucky because Ponyo has a decent-sized kitchen (galley or pantry in boat speak by the way) for a boat of that range (13.8m). There is a stove (with oven) and the layout is pretty acceptable. There could be more work space and storage isn’t that fantastic either but I’m not complaining (ok, maybe a little). Then we only have limited access to fresh water (if we don’t happen to be lying in a marina) and we have to use it wisely (salt water is surprisingly unuseful). Ponyo’s water tank takes 1200l which is a lot, an average boat that size maybe has half. That’s why we haven’t focussed on installing a water maker. It is definitely on the list because we are not crazy about drinking this water without cooking it first (and plastic water bottles mean so much more waste). And even then it can have a stale taste. It’s fine for cooking, even for tea and coffee (if we are short on bottled water) and of course to do the dishes, wash our clothes and for any other hygiene-related activity. On the other hand, since we are surrounded by water there’s much humidity going on and food is molding away like nothing (not only food, anything really). There is no freezer on Ponyo. I know boats that do have freezers, it’s possible, it’s just Ponyo doesn’t have one and so far we haven’t really had the need (and the money) to put one in. Freezers also use up a lot of energy and energy is still always a problem on Ponyo when we are sailing or anchoring (no engine running) – we just never seem to have enough! The fridge is using up much energy as well, so it’s not unusual that we have to switch it off when at anchor with low batteries. We try to make the best of it by experimenting with old-fashioned conservation methods (evaporation cooling etc.). I’ll let the interested reader know about my findings in the blog. Unlike in a caravan or mobile home or any home on wheels where you usually cook when you are parked, on a boat cooking while on the move is no exception. That means – depending on weather and sea conditions – quite often you will be cooking in a moving kitchen. Things move around, spices fly out of the cabinet and you have to be holding onto something (only one hand left to work). The majority of boat kitchens have a so-called gimballed stove (in German: kardanisch aufgehängt), it’s swinging freely so any sidewards movements of the boat won’t cause any pots and pans barf their content over the cook (which can also be quite dangerous if hot). Well, at least it makes it a lot more unlikely. And if you get seasick easily like I do you have another problem. I’ve made dinners that I couldn’t eat myself because at the time I was finished cooking I was feeling unwell. And sometimes I can’t even do that (finish cooking) and one of the boys has to step in. So preparation and ocean-proof dishes are the key. Not boat-specific but still very boat-relevant: bugs and mice. Once they are in it’s tricky to get rid of them. Last but not least there is the problem of trash. It’s insane how fast a family of four fills a trash bag. Mostly with packaging and the infamous plastic water bottles. At sea food waste, paper and even tin cans (when they are sunk. Really, it’s ok, I researched this extensively) can be tossed into the ocean but everything else has to sit there until we hit land. So what to do when the next garbage bin is a couple of hundred nautical miles away? This really bugs me. Soon we are starting our own little Zero-Waste-Project so stay tuned. So in a short – what’s cooking on Ponyo about? In this part of the blog I will document how I’m dealing with these challenges but also what recipes work well for us. Since we have two boys who can sometimes be picky this makes it extra difficult. Especially since they are picky with different things. Except both don’t like lentils which isn’t helping much either considering lentils are one of the last things left after a while at sea. Mein Tipp zum überbordschmeissen der Dosen: mit nem Messer ein Loch reinmachen, damit sie schneller untergehen. 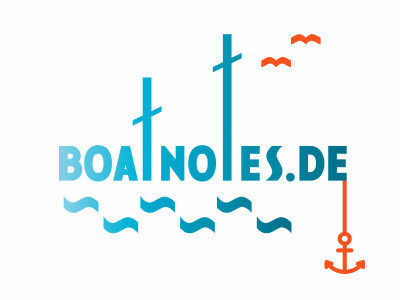 Ohne schwimmen die ewig….